"Silage made from grain crops can be the backbone of on-farm feeding systems," said Mr Rich. This strategy involves being set up for opportunity cropping, with the aim of conserving enough feed to provide for supplementary feeding requirements during three to four years of below average rainfall. "The level of inclusion depends on the desired rate of gain, the quality of the silage and the relative cost of other feeds to balance the ration," said Mr Rich. Most of the silages produced in northern Australia come from irrigated corn and rain grown sorghums. Corn has highly digestible grain and fibre, requiring a large amount of water and management to reach its potential. Varieties are best chosen on their ability to produce grain in the local environment. Mr Rich said it was preferable to choose "starch" type corns with soft endosperm rather than processing types with a hard glassy grain. "Silage sorghums such as Graze’n’Sile, Chopper and MegaSweet are a little more forgiving under warm conditions, but have lower energy and fibre digestibility than corn in most cases," he said. "Conventional grain sorghums make great silage, with higher energy than other silage types, however some yield is sacrificed in the process. Winter cereals also make great silage, even if the yields under dryland conditions are less than the summer crops. Irrigation of these crops during winter can be cost effective when evaporation rates are much lower." 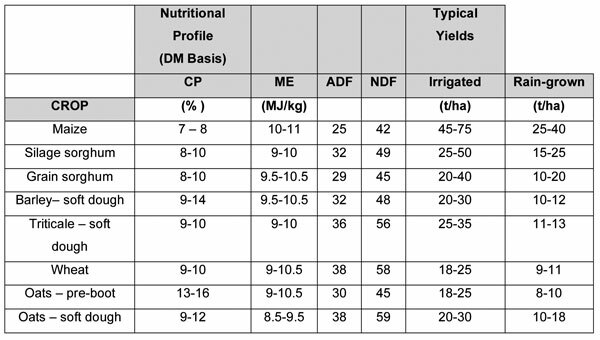 The table below gives some indication of the sorts of yields expected across a range of soil types in an average year. The nutritional values represent an average figure from QSS feed tests and experience. Introducing silage feeding required some planning and decision making about which classes of animals would be fed and for how long. Mr Rich said there were benefits to be gained from supplementary feeding animals during breeding, weaning and backgrounding. "The body condition of Bos Indicus cattle, particularly females, is strongly correlated with fertility and performance levels of the herd," he said. "Optimum body condition will improve both pregnancy rates and weaning weights." In the case of replacement heifers, correct nutrition was vital as nutritional stress could delay puberty and decrease breeding performance in young breeding females. "Supplementing replacement heifers to set them up for their first calf will have an impact on profitability for 10 years or more. This suggests heifers warrant better treatment," said Mr Rich. Silage feeding was also valuable during weaning, helping cows cycle quicker. "With the assurance of an on-farm feed supply, weaning time can be managed effectively to assist the breeding females in regaining body condition to get back in calf when pasture quantity and quality is sub par." Mr Rich said the feeding practice also had a role to play during the growing phase, the period between weaning and finishing. "This is an area of the business which can have tremendous influence on profitability. Trying to estimate what the cost is to the business to have cattle lose weight is quite difficult. Producers have been known to say, even if the value of the gain is equal to the cost of creating it, the impact on cash flow and profitability will justify the investment."